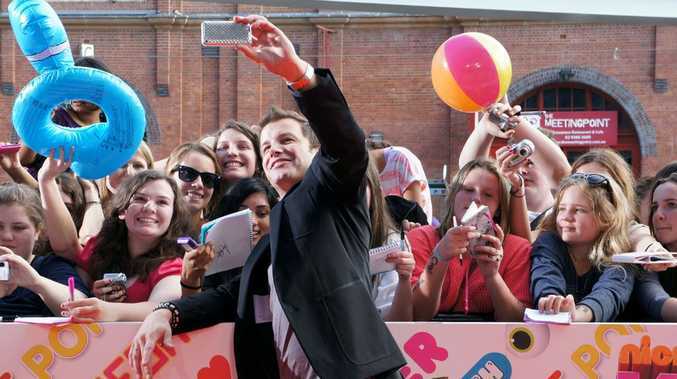 CELEBRITIES were met with a wave of screams at today's 2011 Nickelodeon Kids' Choice Awards in Sydney. Hundreds of young fans began queuing for a spot along the Orange Carpet at 6am this morning, and they saved plenty of energy for their favourite personalities. The child-voted awards took place at Sydney's Entertainment Centre, with Orange Blimps being handed out for Awesome Oldie, Top Toon and Fave Song. Comedy duo Luke and Wyatt hosted the Orange Carpet arrivals, interviewing all of the high profile arrivals including X Factor judges Guy Sebastian, Natalie Bassingthwaighte and Mel B, who had her young daughter in tow. Josh Thomas was unsure about his upcoming on-stage prank, where he was supposed to throw meal worms at another celebrity. Australia's Got Talent winner Jack Vidgen said it was a privilege to be performing at the awards ceremony he was watching as a punter last year. Model Erin McNaught joked that she was going scuba diving after the awards in her designer dress which was made from neoprene. X Factor contestants Nate, Andi and Josh were unsure what to do when an overly excited fan handed them her mobile number. 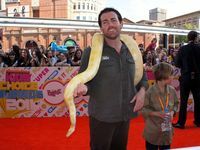 Other celebrities who walked the Orange Carpet included Daniel MacPherson, Shannon Noll, Nathan and Haley Bracken, and Home and Away stars Lincoln Younes, Steve Peacocke and Rebecca Breeds. The Kids' Choice Awards are known for their playful categories. MasterChef's Matt Preston took out the Awesome Oldie prize - over fellow nominees Karl Stefanovic, David Koch and Kerri-Anne Kennerley - and drove a motorised wheelchair out on to the stage to claim his prize. Prime Minister Julia Gillard proved she was still leading the polls in one area - the new Slime Minister category. While the PM herself was not there to accept the award, an impersonator collected the blimp on her behalf and did a quick dance with Justice Crew. Dancer Timomatic opened the awards, which were hosted by iCarly's Jennette McCurdy and Nathan Kress. 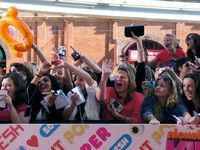 The ear-ringing cheers of the Orange Carpet continued inside the entertainment centre for performances by Cody Simpson, Stan Walker and Natalie Bassingthwaighte. Simpson was the clear crowd favourite, taking home three awards for Super Fresh, Aussie Muso and Awesome Aussie. Young Wildlife Warriors Bindi and Robert Irwin were inducted into the prestigious Hall of Slime and Justin Bieber was named Hottest Guy Hottie. The final Harry Potter film was named Fave Movie and Katy Perry was named Fave International Artist. To see the full list of winners and video clips from the awards go to the Nickelodeon website.